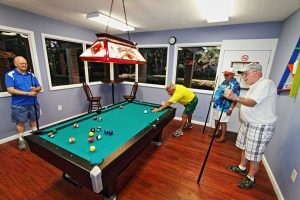 It’s not unusual to find active lifestyle communities for retirees in the Orlando, Florida, area, but how many of them are affordable on today’s baby boomer budget? In addition, we provide you with extra free time to socialize with your neighbors and enjoy the amenities by providing regular lawn mowing, also included in the benefits you’ll receive for your monthly lease payment. That’s a perk you won’t find at many affordable active lifestyle communities in this area. And whenever you’re in the mood for adventure, the theme parks, shows, shopping, dining, and other attractions of this bustling entertainment hub of the Sunshine State are only a short drive away. So come see what makes Hyde Park stand out among active lifestyle communities. Contact us today to arrange a tour of our beautiful community just outside Orlando, FL.